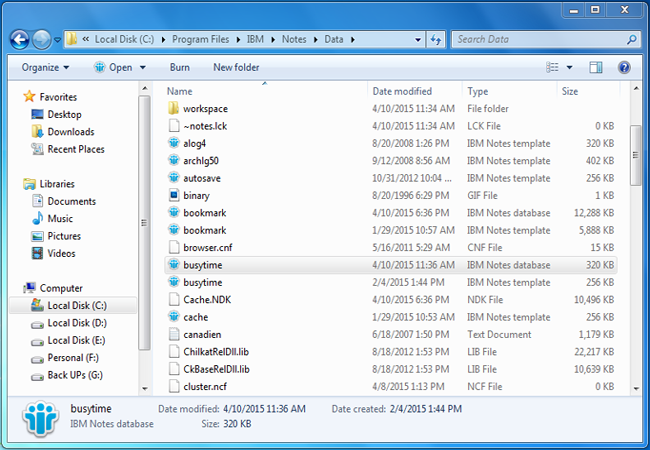 Busytime.nsf can be found in IBM Notes? Busytime.nsf is also characterized as "Free Time Database" as it holds the scheduling info of all the connected Notes users. It delivers the details about free time of the users which benefits in arranging a meetings. It becomes easy to schedule the meetings with others if the free time information of users in available. The Scheduling and Calendar attributes of Lotus Notes aid the users to organize meetings with each other by gathering their free time info. For the execution purpose, both aspects utilize the Calendar Connector (Calconn Task), the Schedule Manager (Sched task),and Free Time System (which is the combination of Calconn, Sched, & notes Tasks). When the user deploys the IBM Notes server on the local machine, the Calconn and Sched Task get spontaneously added to the Notes.ini file which is placed on the Server. On using the server first time. The Schedule Manager instantly generates BUSYTIME.NSF database for a Non-Clustered Mail Server. And make an entry in the file either of those users who filled their details in the Calendar Profile or having a Mail file on the same server. Also in the case of Clustered Mail Server the Schedule Manager created CLUBUSY.NSF file and keep the information of free time of the Notes user in that database just like in Busytime.nsf. When the Notes user sends an invitation for the Meeting to others, then the Free Time system of those users immediately gets activated, searches the free time details and returns the information about the user availability. On mentioning the appointments in the Calendar, the Schedule Manager instantaneously accumulates the information and updates them in the Free Time Database.